Home > Blog > Tech Tips > Having Porosity Problems with Gasless MIG Welding Wire? 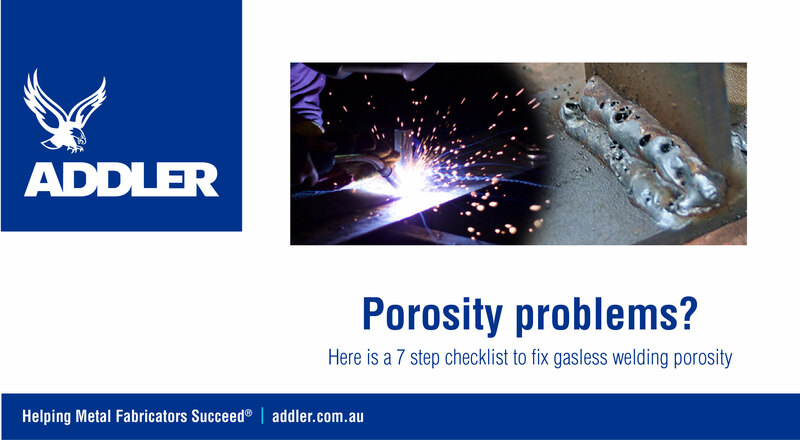 Porosity (air bubbles or pin holes in the weld metal) is not only ugly, but it will also significantly weaken the weld joint. The wrong polarity will cause porosity and a host of other problems too. Check that your earth lead is connected to positive (+) and the torch/wire to negative (-). If in doubt, check out our article on gasless wire polarity. With Gasless and flux-cored wires, you should always drag the torch, similar to stick electrode welding. This is the opposite to MIG welding (with gas) where you would normally push the torch. While the arc may feel smoother with a high voltage, one of the most common causes of porosity is too much voltage (heat). Try turning down the voltage setting on your welder. Note that some gasless wires are more sensitive to variations in settings than others and are more prone to porosity problems. One of the reasons why many welders prefer Weldclass Platinum GL-11 gasless wire is because it is very tolerant to variations in machine settings and characteristics, and is very resistant to porosity and other issues. Gasless wire is usually more tolerant towards dirt, rust, paint and surface imperfections than standard MIG welding (with gas), however the fact remains that poor surface condition can still cause porosity and other problems. Sometimes the parent metal can look relatively clean, but has been contaminated with grease or other substances that have penetrated the steel. If the material being welded is dirty or if you suspect it has been contaminated, prepare a test piece that is completely clean and has not come into contact with oil. If necessary, grind or linish the test piece to ensure contamination is completely removed. Run some test welds on the test piece – if the test welds are free of porosity then it is very likely that surface contamination is the problem. If the test still exhibits porosity, then check the other potential causes in this article. Some gasless wires are more “fussy” than others about surface condition. Platinum GL-11 wire is very tolerant to imperfect surfaces, making it very easy and hassle-free to use. The integrity of the earth clamp and earth connection is critical. Defects at any point along the ‘current path’ (which includes the earth) can contribute to issues like porosity. Check the earth lead connection to the welder, the earth cable, the earth clamp, and the earth clamp connection to the job – and rectify any loose connections, worn components and defects. Also note that the earth clamp should be as close to the weld location as possible, to provide the most direct ‘current path’. Our article & video on earth clamps has some great info on this topic. Yes gasless wire is often used in the field and is certainly the best choice for windy conditions. However, if the wind is particularly strong this can porosity. To shield the weld, gasless wire relies on both a slag system and the gases produced from chemical reactions in the arc. Strong wind can interfere with this gas shield, exposing the molten metal to the atmosphere and cause porosity. If you suspect this might be happening, run some test welds in a sheltered area. Compared to standard solid wire, Gasless wire is much more prone to quality variations from one brand to another. This is because the performance of the wire is very dependent on the formula of the flux inside the wire, as well as the integrity of the filler metal. While different gasless wire brands may comply with the same classification, each manufacturer will have their own formula and therefore each wire will behave differently. If the wire you are using is proving difficult to run, try Weldclass Platinum GL-11. Thousands of Aussie welders rate GL-11 as the best, most user-friendly gasless wire they have ever used. Tech Tips ADDLER, Welding Equipment. permalink.